It was from the main and only Predator.. It is his creature foot as well as his shin a rmor. (which is very rare) usually the armor is attached and kept with the body suits. It is made of a poly-foam built on a shoe with the armor attached via velcro. There is a purposeful split in the top of the foot. This is for bending and flex of the foot. 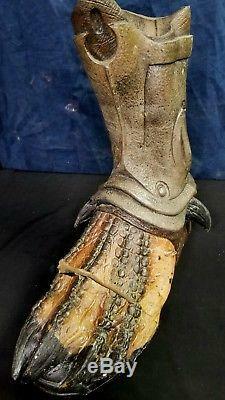 Details include nice paint scheme, horns on ankles the shin armor is foam latex and painted to resemble a metal armor. It is in very good shape. Some wear and scuffs on paint some little tears on armor, but in every good screen used shape. This originally came from the Studio that created all the creatures (Predators Aliens) for the film. 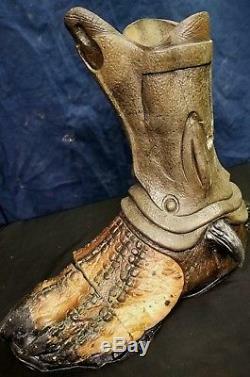 This is a amazing piece to add to your prop collection! PLEASE CHECK OUT OUR OTHER AUCTIONS! 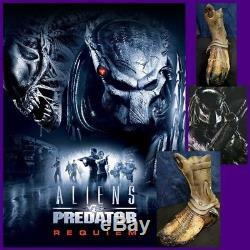 The item "Alien vs Predator AVPR screen used movie prop horror predator foot and armor" is in sale since Friday, December 28, 2018.